This annual clinic is open to any Opti sailor age 8-14. The Opti Clinic is a great way for young sailors to shake the rust off and get out on the water prior to the start of Opti Team practices. Sailors are divided into groups by racing ability and moved from group to group as appropriate. The clinic includes coaching, lunch and first come first served use of SSP’s boats. Each summer SSP hosts a one-day novice regatta as part of the local Milfoil Dodger series. Beginning in July, five Milfoil Dodgers take place throughout the Seattle area to introduce novice racers to racing and the format of regattas. Each event is casual, fun filled, and coaching is encouraged. Meydenbauer Bay Yacht Club, Seattle Yacht Club, Corinthian Yacht Club, and Mt. Baker Rowing and Sailing also participate. The name “Milfoil Dodger” comes from sailors avoiding the widespread milfoil (an invasive aquatic plant) in Seattle’s lakes. NWYRC’s largest event, and a longtime SSP favorite. We expect about 150 youth sailors in Optis, Lasers, and FJs for this weekend event. Late September brings heavy breeze and a lot of variety in weather, making Octoberfest an exciting event. Email info@sailsandpoint.org if you are interested in volunteering at the event. For registration and results, please visit this page. 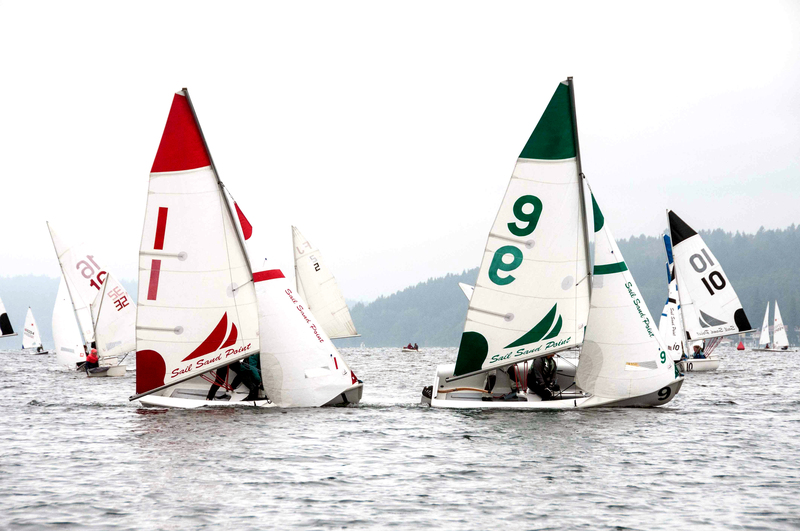 Giving high school and college racers a chance to connect, Cascadia Cup is a joint NWISA/NWICSA regatta that invites high school and college teams from all over the Northwest. In addition to the Saturday/Sunday racing, each university team does a short intro to their school and sailing program in order to give high schoolers an opportunity to learn about their future sailing options. The combination of the two circuits also means lots of boats and extra fun racing. Email info@sailsandpoint.org if you are interested in volunteering with food or race committee at this event.